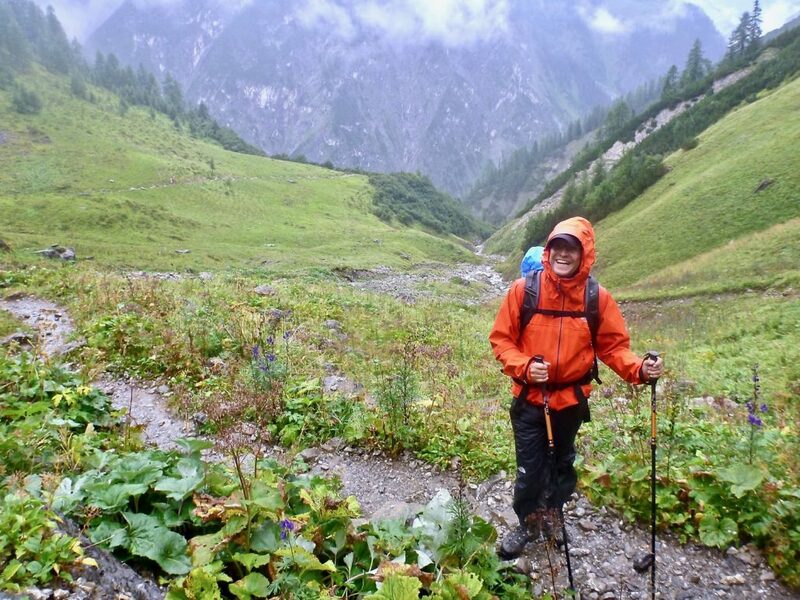 I woke up and the landscape outside the hut looked very wet. It had been snowing last night but now all the snow turned into rain. 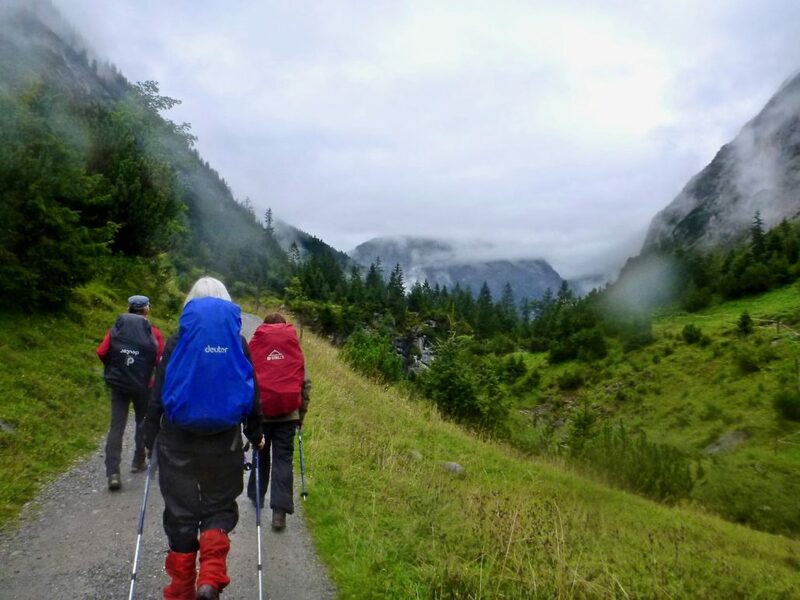 We all had to dress up in our rain gear for our today’s hike from Kemptner hut to Memminger hut. 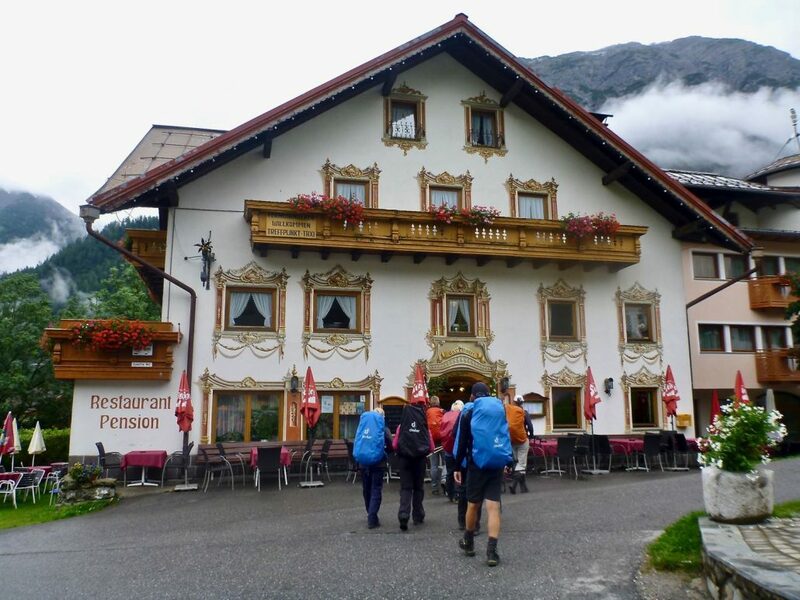 Our first goal was to climb up to the Maedelejoch at 1974m where we would cross the border into Austria. On slippery rocks this wasn’t too easy and we all had to be careful. 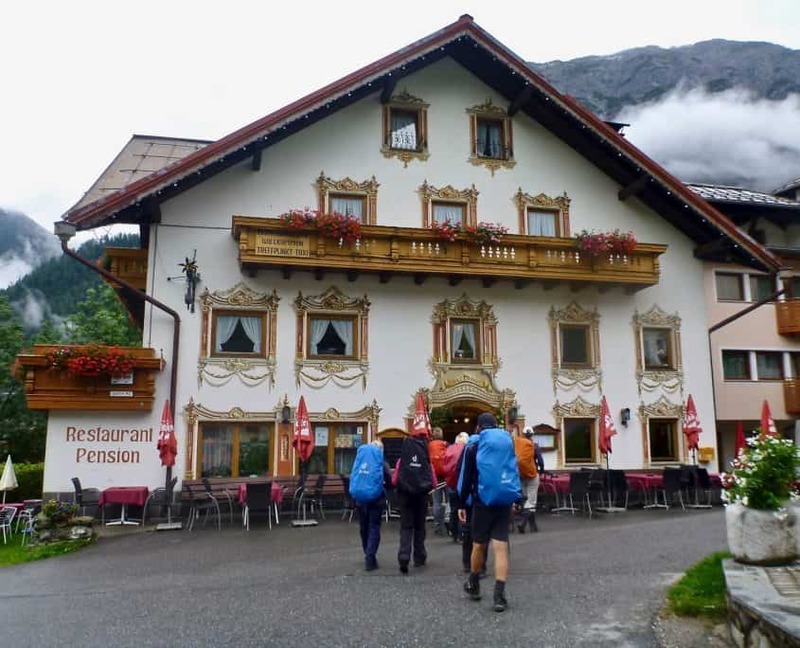 When we reached the Maedelejoch, only a small red and white border sign showed that we would pass into Austria. The sign also stands there to give orientation in case of high snow. 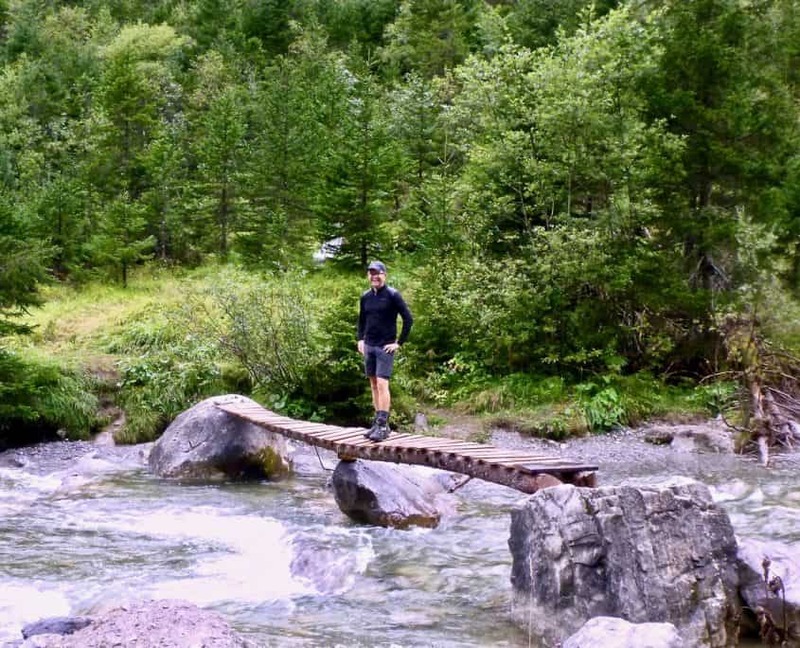 The next section was a steep downhill on slippery rocks. On our way we passed by a usually scenic waterfall but due to the rain our photos didn’t get good enough. Even thorgh the weather wasn’t very inviting the whole group was in a good mood and we enjoyed the start of our adventure together. It turned out that after this one day of rain we should be very lucky with the weather for the rest of the trip. After loosing lots of altitude we were relieved once we reached a more flat section. 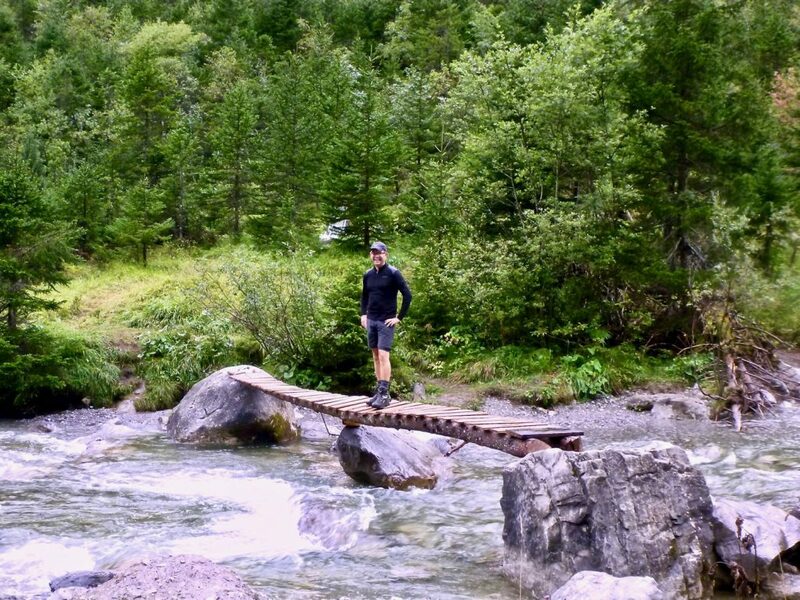 We all had a smile on our face after our entertainer of the group – Rainer – made some fun on a nearby bridge. 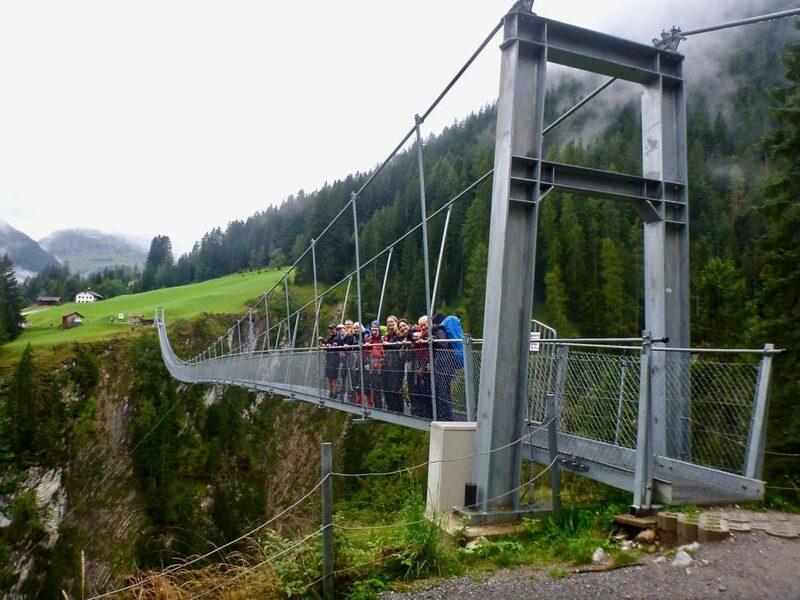 Our next attraction short before we reached the village of Holzgau was also a bridge. 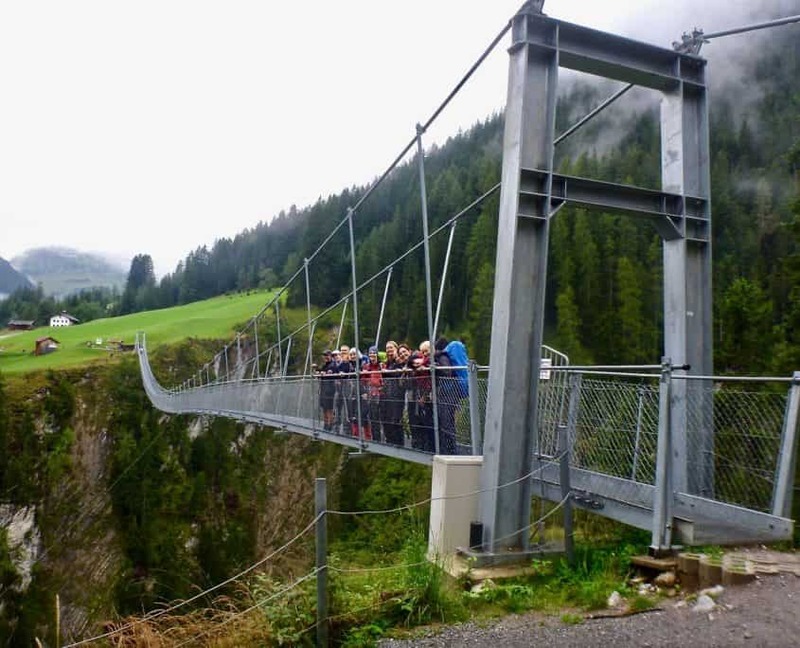 More than 200 meters wide and 105 meters high the cable suspention bridge in Holzgau is one of the biggest pedestrian bridges in Austria. It was a bit hard for me to walk across as I am afraid of the heights. In the end we all arrived safely at the start of our next climb. 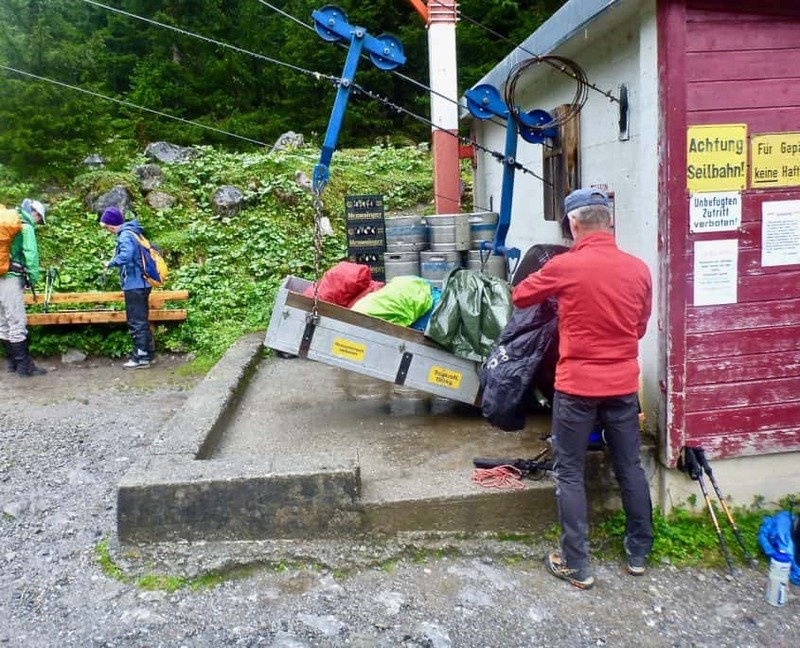 Again we used the ropeway of the hut to transport our big backpacks up the mountain and just took our small daypacks to climb up to the Memminger hut. 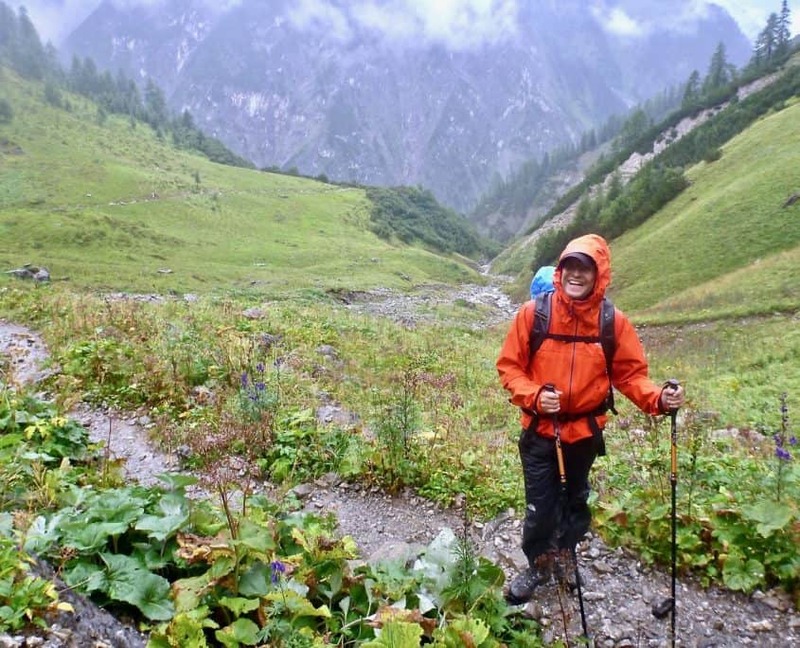 Every experienced hiker knows that the weather can instantly change in the mountains. 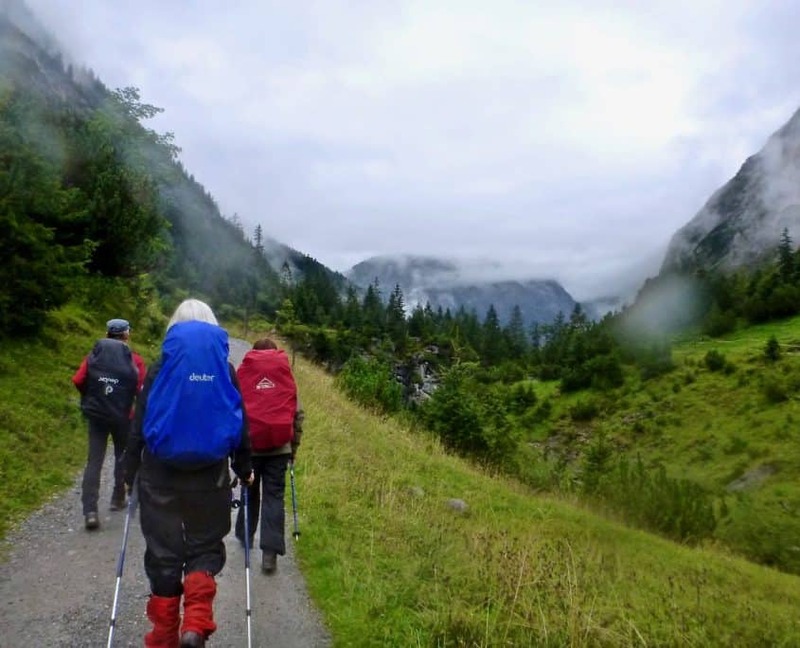 While we were climbing up to the Memminger hut we gained elevation and the temperature dropped. The rain that was falling turned into snow. Short before the hut we could hardly see anything and we even used the small crampons that we carried. 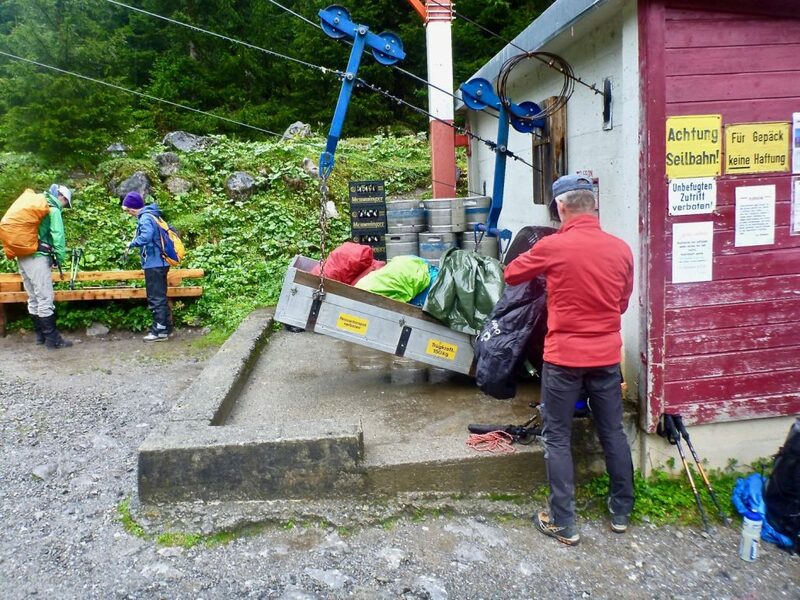 Cold and wet we arrived at the Memminger hut at 2242 meters. 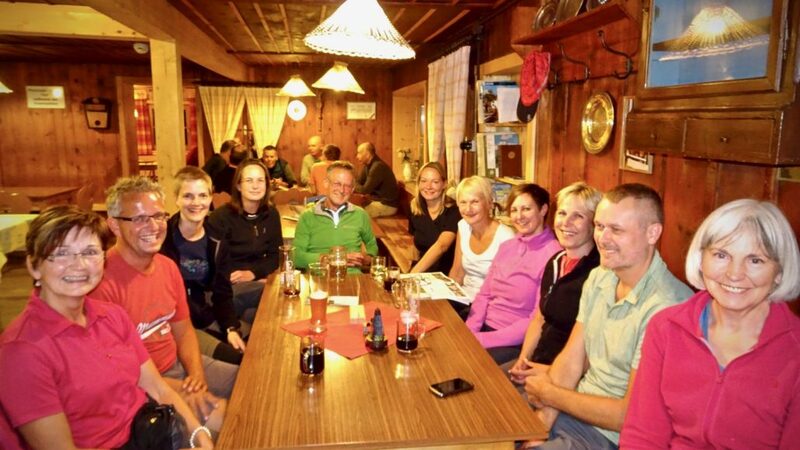 And even more we enjoyed the excellent foods and drinks on an Austrian mountain hut!